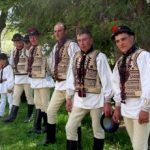 The structure of Romanian traditional clothing has remained unchanged throughout history and can be traced back to the earliest times. The basic garment for both men and women is a shirt or chemise, which is made from hemp, linen or woollen fabric. This was tied round the waist using a fabric belt, narrow for women and wider for men. The cut of this basic chemise is similar for men and women. 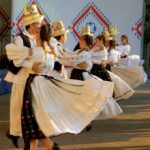 A rich variety of traditional dances still exists in Romania due to the continuation of the feudal system until the mid 19th century and subsequently the isolation imposed by Ceausescu, which resulted in the continuance of a peasant life style. Romania is a unique European country as its folklore still exists in its natural environment, but this is now fast vanishing with spread of western culture and modern technology. The earliest music was played on various pipes with rhythmical accompaniment later added by a cobza. The bagpipe was popular from medieval times, as it was in most European countries, but became rare in recent times before a 20th century revival. Since its introduction the violin has influenced the music in all regions by becoming the principal melody instrument. 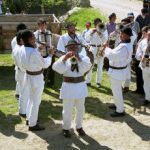 Each region has its own combination of instruments, old and new, and its own unique sound. This continues to develop to the present day with the most recent additions being electric keyboards and drum sets.